This post is brought to you by DAIRYLEA. 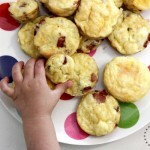 I was asked recently by DAIRYLEA if I had any fun food MUMMY HACK ideas – ideas that help make a Mum’s life easier. “No, but I’d love to hear of some,” was my first thought. Haha! But then, when I really thought about it, I realised that actually I do have a few “MUMMY HACKS” of my own that I could share. So here are my top four “MUMMY HACKS” for making fun and healthy food that kids will love. If you have any, I’d love to hear of them too! 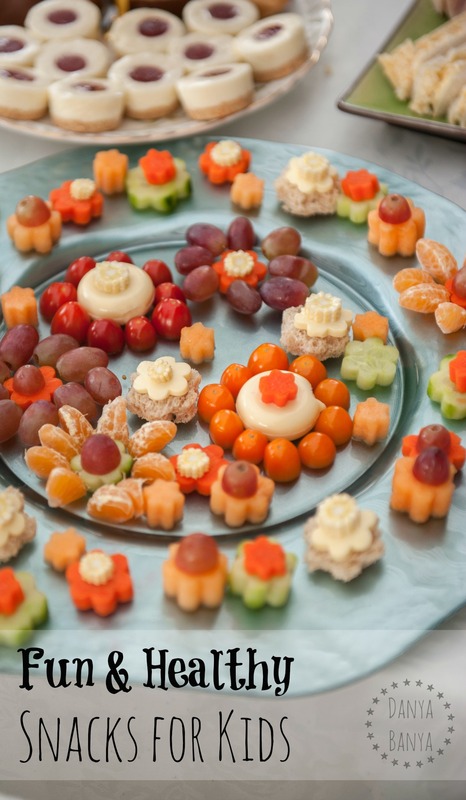 Mummy Hack #1: Use graduating cookie cutters to make fruit, veg & cheese stacks! 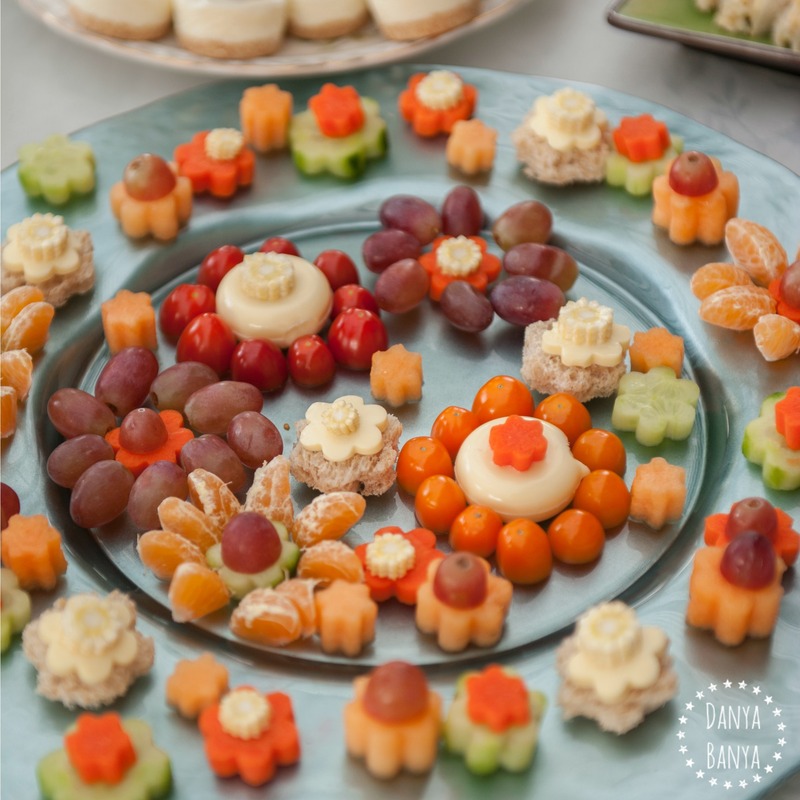 I made this healthy fruit, veg and cheese platter just this past weekend, as our contribution to a ‘high tea’ themed birthday party. The kids had so much fun helping me make it, and it wasn’t nearly as complicated as it first looks. The best bit was that the kids wanted to snack as they helped, so I ‘let’ them eat the offcuts. That’s a good serving of fruit, veg, fibre and dairy right there, before they even saw any of the tiny little cakes – winning! It also meant that I had lots of healthy food options to snack on during the party too. It’s much easier to resist temptation that way! Start with the bigger flowers first, so you can position them around the platter. (You can easily add the smaller flowers later on.) DAIRYLEA Cheese Pods make great flower centres, surrounded by halved cherry tomato ‘petals’. With different sized flower cookie cutters, it’s easy to stack a smaller flower on top of a larger flower, creating a pretty graduating-layer effect. I used this technique to layer carrot, cucumber and rockmelon flowers. It also worked well for cheese flowers (cut from DAIRYLEA Cheese Pops) stacked on larger wholemeal bread flower bases. 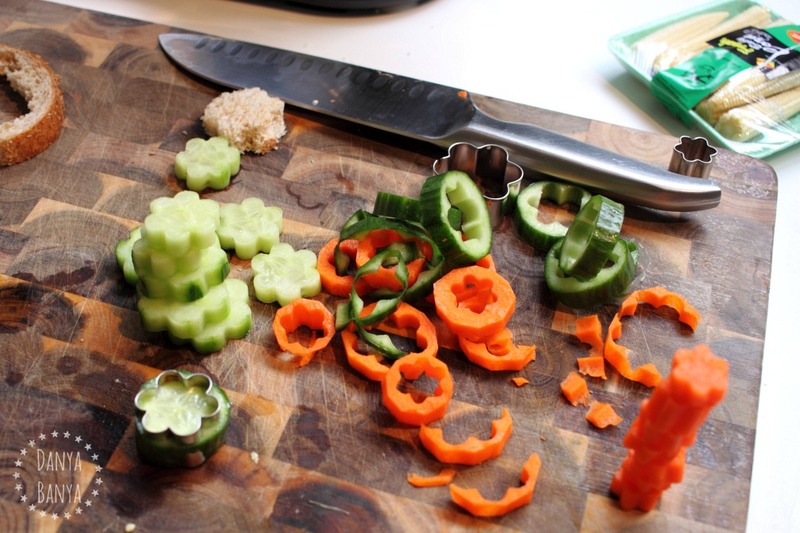 Baby corn slices make a great stack toppers, as they are a pretty flower shape already. Head over to the MUMMY HACKS Website to see my three other “MUMMY HACK” ideas for Fun and Healthy Snacks for Kids. Have you tried any of these? Which one is your favourite? 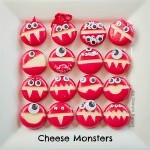 And make sure you are following my Fun & Healthy Snack Ideas for Kids board on Pinterest. I’m always pinning new ideas on there. 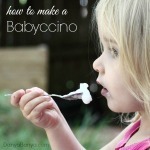 Follow Danya Banya’s board Fun and healthy snacks for kids on Pinterest. Many thanks to DAIRYLEA for partnering with Danya Banya, and supplying the cheese products for this post. Thanks also to Megan Webb Photography for kindly taking the first (and fourth) image. 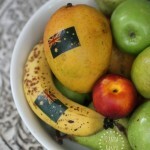 Australia Day lunch box idea: Aussie Fruit! 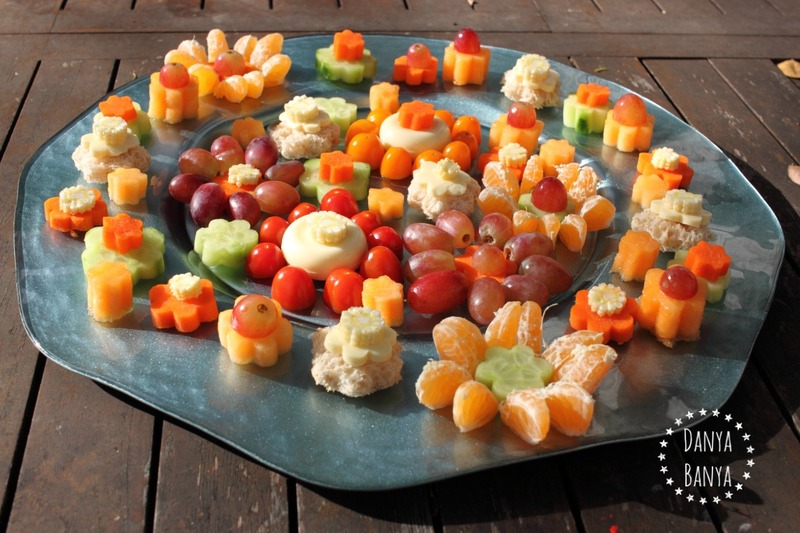 We always have a huge fruit platter at our kids parties but yours looks super special! Bet that didn't take long to disappear! Very clever idea. And fun! Such a great post. I love the platter idea and I think it works so well with kids. I love the fruit skewers that are also on the Mummy Hacks website. Thanks Kate. We make fruit skewers all the time at our place – somehow everything is more fun on a stick! Thanks Kate. If I'm honest my kids prefer the sugar-laden stuff, (must be the Golden Gaytimes I ate when I was pregnant, lol) but they'll happily munch on the healthier stuff if it comes out first (especially if they are hungry)! 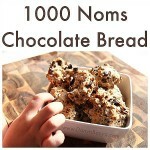 Following your fun snacks board! Its too cute!